One of the most fascinating magazines on the newsstand is always Popular Mechanics, and their aviation stories are first rate. When I want to bury myself into a long, in-depth story with spectacular reporting and endless facts and figures, PM is where I always head. "The friendly skies are getting expensive. Airlines spent $25 billion more on fuel last year than the year before, and they're expected to spend $50 billion more than that—$183 billion—by the end of 2008. The military is also concerned about the high price and foreign sources of oil, and that's got it testing synthetics and more. As cheap oil fades into memory, we get an update on research into new ways to power tomorrow's airplanes—and lower the cost of riding them." The PM article mentions Coal, Biofuel, Algae and Designer Hydrocarbons as the first four of the five green fuels Ladd highlights. Each of these alternatives to dead dinosaurs represent a clear path to help ween ourselves off of foreign oil. Coal and Biofuel might be more "top of the mind" in this discussion, and unless you are an alt-fuels expert, certainly a brow will be raised at the thought of burning fuel made from green, slimy algae in your 747. And when we think of these 'Designer Hydrocarbons' of which PM speaks, our mind may think of fuels made by Gucci and Versace, sold at trendy boutiques on Rodeo Drive. But it is the fifth form of green fuel that the PM article describes that is really, seriously, pollution free. Solar. At this point, solar energy for aircraft power is still in its infancy. 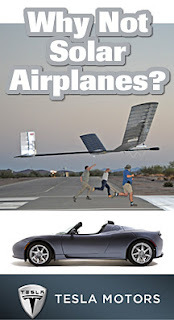 But as we arrive at a point where cars like the Tesla Roadster become available, is it such a stretch of our imagination to envision this technology evolving into the aviation market? The breathtaking Tesla Roadster rockets 0-60 mph in 3.9 seconds on its way to a 125 mph top speed...without burning a drop of oil in its all-electric power train. If they can craft such a road machine that can squeeze this kind of performance from a 248 HP engine with an insane maximum rpm of 14,000...imagine what might happen when that much power was hung off the front of a single-engine GA plane. O.K., I know what you're thinking. When all the useful load is taken up by the weight of the batteries required to power an all-electric aircraft, would there even be enough useful left for a pilot? But remember, friends, who would have thought back when AOL 1.0 was unveiled that today we'd be surfing the web at 3G speeds...on our telephones? The power of U.S. innovation is massive, if we just provide the push to make it happen. I say we'll see a certified electric/solar GA plane in 10 years. This design may have a skin made of thin solar panels powering a bank of yet-to-be-invented super-light batteries or maybe some other solid-state "power containing" devices – think gigantic flash drives. If you think this is just too far out there, consider this: Digital SLR cameras have only been around since 1991, and the first ones cost north of $30,000 for 1.3 megapixels! This week, Canon has just released their unbelievable 5D Mark II DSLR, a full-frame, 21 megapixel monster that also shoots full HD video at 1920 x 1080 resolution...at just $2,699 body only. This is the speed by which today's technologies evolve, and we all should expect no less for solar and electric powered vehicles, be they driving or flying machines.